Bucs Lock Up Superstar ! Lavonte David got paid more than DeAndre Levy like I predicted. 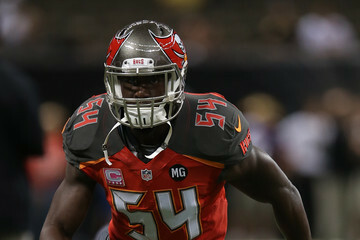 Today, the Tampa Bay Buccaneers extended superstar outside linebacker Lavonte David. According to Ian Rapoport of NFL Network, Lavonte David signed a 5 year deal worth $50.25 mil with $25.56 mil guaranteed. The 25 year old superstar was entering his final year of his rookie contract. David’s new deal will kick in the 2016 season. Lavonte has accomplished a lot for only being in the league for 3 years. He is entering his 4th year. Lavonte had a great 2014 campaign, but lacked the interceptions due to the quarterbacks realizing they need to stay away from him. Now, with the defense getting better and can potentially be top 5 this season, look out for Lavonte to get his interceptions rate back up. Lavonte’s best season in his career was 2013, where he notched 7 sacks and 5 interceptions with 145 tackles. David is a franchise type defensive player and is a tackling machine, also he is the only linebacker in the past 3 seasons to take on the the most physical running backs and take them down with ease. That list includes Adrian Peterson, Le’Veon Bell, Marshawn Lynch, and many more. That is hard to do by yourself. Lavonte was also named to the 2013 All-Pro team and is clearly the best 4-3 outside linebacker in the game right now. David and McCoy are one of the 2 best pairings in the NFL. At least the best in a 4-3 defense. Both of them are locked up and will look to be like Derrick Brooks and Warren Sapp back in the glory days. Previous Post Lions Extend Levy !